I don’t know how you feel but as I mature, I want things to get easier, not harder. I originally planned to go on this trip to Israel after I floated the idea of a DVI-like clinic in East Jerusalem at the Alliance for Oral Health Across Borders Conference. And when Dean Ismail asked me to go with him to pursue the idea, I agreed and began looking into making plans, including using my American Express Rewards points for comfortable travel accommodations. I like easy and traveling 10-11 hours is not simple. But then Trump was elected. And, talk began of moving the US embassy to Jerusalem. Knowing the politics as I do, I realized that should such talk continue, an increase in violence and terrorism would ensue. I suspended my plans. I’m only partially crazy. Then, abruptly, and despite the choice of a right-leaning US Ambassador to Israel, the talk of moving the embassy stopped. No rhetoric, not even any tweets about it. My personal thoughts are that meetings with Egyptian President Morsi and King Abdullah of Jordan contained some discussion of how moving the Embassy at this time would throw fuel into an already burning Middle East cauldron. I believe they convinced our President to cool it. So, I resurrected my plans but was unable to get any premium seating. So, I travel to Jerusalem in a less than “easy” way. They have redesigned the planes to make them less passenger friendly unless you pay premiums. 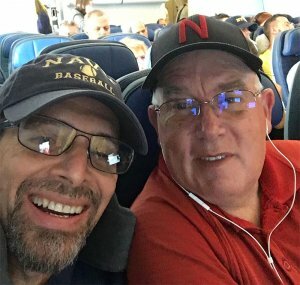 Here, on the plane with Nick, a retired civil engineer from Omaha, Nebraska who is going to tour Israel with his church and retired Pastor Goertzen. Jerusalem is an amazing city and I’m blessed to be able to do good there. Jerusalem is the heart and sole of the Jewish people. It is THE singular most important site for anyone who adheres to any of the forms of the Jewish religion. Return to Jerusalem has been the prayer Jews around the world have asked to be answered since they were removed from it first by the Babylonians in 586 BCE by Nebuchadnezzar and then again by the Romans in the year 70 CE, by Vespasian and Titus after the second Temple was destroyed. This incident is commemorated on the Arch of Titus, which can be seen today on the Via Sacra in Rome. Enough of ancient history, though history and archaeology, which supports history are important players in the politics of this part of the Middle East. The remnants of the temple, to the Jews is like a sacred gravestone commemorating a long and tortuous history. Some competing interests have looked to deny or minimize the history. During the war of independence in 1948, the Old City of Jerusalem was again lost to the Jews, who had been living there under Ottoman rule up until their defeat in WW II. Now, this area was controlled by the Jordanians , who destroyed century old synagogues and much of the Jewish Quarter. Jerusalem was again “juden rein” or free of Jews. 50 years ago, during the “6-day war”, Jerusalem was united. The Jewish quarter was rebuilt and the Old City bustles with tourists from all religions. Next Tuesday, May 23, Israel celebrates this event as Yom Yerushalayim, or Jerusalem Day. Well, because of the change of plans due to political circumstances, I am now seated in “cattle class” and my senior back is complaining, though I did manage to sleep 6 hours thanks to some pharmaceutical encouragement. We land soon and I’ll make my way to Jerusalem where I’ll meet up with Dean Ismail. As it happens, tomorrow, Monday May 15 is Palestinian Nakba Day, when they commemorate Israel independence as a tragic event. University Dental School. We’ll have to yield the circumstances and security issues. Our radar is up. It will also be interesting to see how the plans for President Trump’s arrival impact our mission. It’s not easy to build Bridges to Peace over swirling waters. I’ll try to keep in touch.